The truck left Citi Field today packed with equipment for spring training. Pitchers and catchers report in 11 days. I’m ready for some spring training games – I love this time of year. Surprise!!! Attendance at Citi Field was down again. Home attendance has been dropping steadily since the Mets moved into Citi Field in 2009. They went from 3.1 million tickets sold to 2.5 (2010), to 2.3 (2011), and now bottoming out at 2.2 million. If you’ve been to a game this year, you know that they didn’t have the 27,000+ average tickets sold in the park. It was a ghost town unless R.A. Dickey or Johan Santana were pitching. 33% of the available tickets went unsold this year despite the team’s aggressive marketing tactics (you know what I mean if you’re on their email list). And they reduced ticket prices this season… Again. Maybe the Wilpons and Sandy Alderson might start to get the idea that they need to win some games to sell tickets. That would be a novel idea. 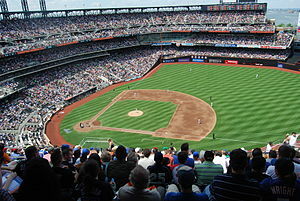 According to ESPN stats, attendance at Citi Field is down about 10% in 2012 through the first 19 home games. The Mets are averaging 27,683 paid per game. They finished 2011 averaging 30,108 in a park with a capacity of 42,000. The Mets finished 2011 averaging 14th in MLB in home attendance. So far in 2012, they’ve slipped to 16th in the league. Of course, much of attendance can be attributed to on-field performance. But the Mets have surprised early this season tied for third in the NL East and attendance is still slipping. The visiting opponents have a lot to do with interest in buying tickets as well. So far, the Mets have hosted the Braves, Nationals, Giants, Marlins, D-Backs, Brewers, and Reds. The backlash against the Wilpons for the Madoff Ponzi scheme lawsuit also has something to do with fans staying away from Citi Field in my opinion. Allowing Jose Reyes to walk away in free agency because of related financial constraints didn’t help sway ticket buyers either. It’ll be interesting to watch how attendance fluctuates this season. My guess is that the average game attendance continues to slide as the Mets begin to gravitate toward their predicted finish of an under-.500 team. A report by Forbes details the Mets bridge loan from Bank of America and how it was used to pay the debt payment on bonds that financed Citi Field. I wrote about the bridge loan on Monday and the story for the Mets gets worse as more details emerge. The Mets partially funded Citi Field with $547 million of tax-exempt bonds. A payment was due last month for $43.8 million and the Mets didn’t have the money to pay. The holding company for the bonds, Ambac Assurance Company, had promised to pay the debt payments if the Mets defaulted. But Ambac went belly up in 2010 and filed for bankruptcy. So the Mets defaulting on the debt payment would have left the bond holders with nothing to show for their investment in the team. The Mets still have payments coming due of $32 million in each of 2013 and 2014. So there’s still a chance they could default. But the Mets are planning to use the $40 million bridge loan to tide them over until they can sell pieces of the team to “small” investors in hopes of raising $200 million. It’s a sad state of affairs for the Mets. Hopefully, it won’t end in bankruptcy court like the Dodgers and Rangers did recently. In the meantime, we’re the ones left holding the bag with a team that doesn’t appear to have a chance of a winning record in 2012.